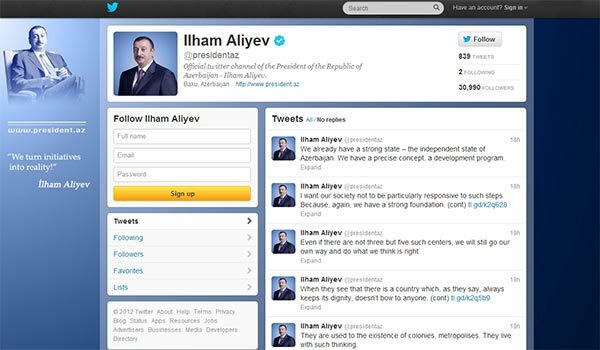 Azerbaijani President Ilham Aliyev has used the online social network to unleash a barrage of disparaging tweets against Armenia. “Armenia as a country is of no value,” Aliyev, in particular, tweeted on Tuesday in what was excerpts of his original November 16 speech at a meeting of the ruling New Azerbaijan Party, celebrating its 20th anniversary. “It [Armenia] is actually a colony, an outpost run from abroad, a territory artificially created on ancient Azerbaijani lands,” he added, according to RIA Novosti. The Azeri leader said his country would “continue to expose Armenia’s aggressive policy in all international organizations” and repeated his earlier controversial comments regarding the Armenian Diaspora. “I have often talked about it, I want to say it again without fearing anyone – our enemy is the Armenian lobby,” said Aliyev. Armenia already reacted to the original remarks by Aliyev. In his Saturday comments Deputy Speaker of Parliament Eduard Sharmazanov implied the Azeri leader had a “sick mind”. Armenia and Azerbaijan have been locked in a bitter conflict over Nagorno-Karabakh since 1988. Internationally mediated talks have not led to progress in finding a solution to the protracted conflict in the past two decades or so.